Neem Oil Insecticide - Does It Work? Neem Oil for Cats. Is it Safe? So you'd like a recipe for making neem soap? No problem. 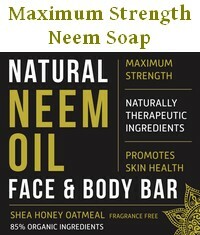 Would you like to do it the easy way, or do you want to make your neem oil soaps from scratch? If you've made soap before you will be interested in the recipes below. But if you've never done any soap making scroll or jump down to the short cut version: how to make neem soap the easy way. Proper soap making is quite a task and requires some good equipment. You need to handle some fairly dangerous ingredients (lye! ), and you have to get the amounts just right. If you know what you are doing then go ahead and try the two neem soap recipes below. If you are making neem soap from scratch for the first time, then use the detailed instructions here: Neem Oil Soap Recipes. This is a recipe for a mild neem soap that can be used daily. It is good for young people with oily skin, doesn't stress dry skin, it should clean up mild acne, prevent skin infections, soothe irritations, lighten moles and scars, and do all the other wonderful things that neem soap does. Which fragrance or essential oil you use is your choice, but you want to make sure you mask the smell of the neem oil. This neem soap recipe is actually a recipe for a neem shampoo, but a solid one. A neem shampoo bar, so to say. You can use it daily. It is mild and good for all hair types. It leaves your hair shiny and strong, and if you have kids you'll be glad to know that it should also prevent head lice infestation. Obviously there is room for variations here. You may have your own preferences regarding ingredients and hardness, herbs and essential oils to add, according to your particular hair type or skin problem. But the amounts above are tried and tested and make a good neem soap bar. 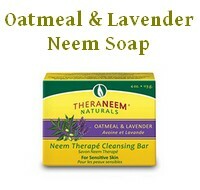 You still get a great neem soap for everyday use that will benefit your skin or hair a lot. 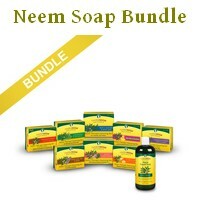 What you can't do is produce maximum strength neem soap to treat parasite infections or other serious skin problems. Maximum strength neem soap has a neem oil content of at least 20%. Clear glycerin soap can be bought in large blocks. Craft shops sell it as "Melt and Pour Soap Base". You can cut it into chunks and melt it down. When you buy your soap base make sure you get a good quality soap. The neem soap you're making will only be as good as the base you use. Make sure you get a very mild soap, with a good smell, made from real saponified natural oils, not with chemicals. The only other necessary ingredient is neem oil. Cut off whatever amount of soap you want to use. Melt the soap in a bowl in the microwave or a double boiler. If using microwave stir frequently and make sure it doesn't overheat or boil. You can also stir in colors, fragrances or essential oils. Simple, huh? Your soap is ready to use as soon as it is set. 20 minutes to an hour in the freezer should do. Undaunted she printed out some neem information, and sold the soap as neem soap. And wouldn't you know it, two weeks later a half hysterical lady approached her stall, raving about how the neem soap had performed a miracle and cleared up the eczema on her hands! She walked away with a whole box of the brown soap. After that a lady from a neighboring stall got interested. The cortisone shots had done nothing for her eczema. So she tried a bar of the brown soap and sure enough, it helped her, too. Anyway, both neem leaf and neem bark have healing properties as well. They contain the same ingredients as neem oil, just in different concentrations. 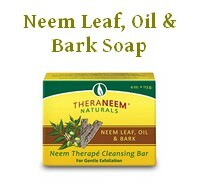 Especially the neem leaf is valued in India, where neem originates. It's the neem leaf that is often used to treat skin disorders, wounds, sprains, even parasite infections like scabies. So, if you don't mind the brown color, why not add some neem leaf or bark powder to your melt and pour neem soap? Copyright © 2007- Birgit Bradtke. ALL RIGHTS RESERVED. This website does not sell any products. DiscoverNeem.com is intended for informational purposes only. Neither the information nor the products mentioned on DiscoverNeem.com are intended to diagnose, treat, cure or prevent any disease. None of the information presented on this website is to be taken as medical advice. Always consult a qualified physician or health care provider for diagnosis and treatment of any condition. Neem should not be taken by anyone who is pregnant or trying to conceive. Neem contains compounds similar to those in aspirin and must never be used to treat children with fevers. It should not be taken by people with known allergies to aspirin and aspirin like substances. Neem oil should not be taken internally.